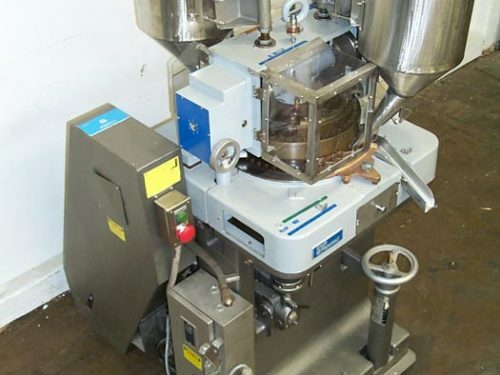 Courtoy Model R100/36, 30 station rotary tablet press rated up to 2850 tablets per minute – depending on materials and application. Tablets: up to .748" diameter x up to .787" fill depth. Has 8.8 tons of compression. Equipped with B type tooling, forced rotary feeders, dust extraction system, 12.99" pitch diameter of turret, air compensator on pre-compression, cooling unit, hydro-pneumatic compensator, 18"L discharge chute with two pneumatic diverter gates and two photoeyes, 10" diameter S/S powder hopper with sight glass, and one piece high strength steel turret with hard chromed working surfaces. Integrated tablet checkweighing system, precompression station with air compensator of 3kN max force, E-stop, and barrier guarding with electrical interlock. Mounted on heavy duty base frame. Customer to supply tooling.